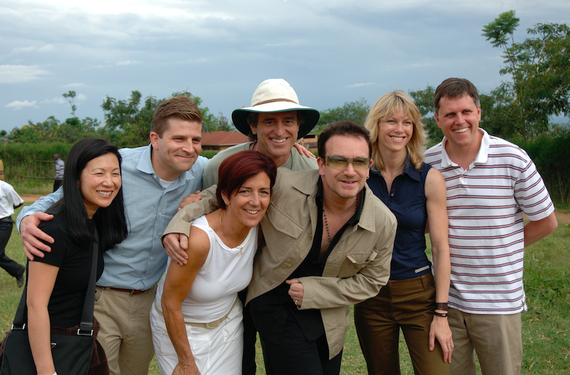 Ten years ago I was in Lesotho and Rwanda with Bobby Shriver, Bono, Sir Richard Feachem and others committed to fighting HIV/AIDS in Africa. We came together through Product (RED), an innovative idea that joined NGOs, governments, health care experts, global brands and celebrities to raise awareness and funding toward the bold goal of eliminating HIV/AIDS in Africa. As a part of the Gap (RED) launch team, I got to see first-hand the need that existed as well as the hope that new treatments provided, if only the funding were available. As we celebrate World AIDS Day and the 10-year anniversary of Product (RED), I had an opportunity to interview one of (RED)'s founders, Bobby Shriver - an activist, journalist, philanthropist and civic leader - to take a look at the progress made fighting HIV/AIDS in Africa. The (RED) team in Rwanda in 2006 for the launch of Product (RED). From left to right: Bobbi Silten from Gap Inc., David Maddocks from Converse, Leslie Dance from Motorola, Bobby Shriver, Bono, Tamsin Smith from (RED) and Dan Henkle from Gap Inc.
1. In the first 10 years of (RED) what was accomplished and what do the next 10 years look like? Our biggest accomplishment has been to bring this issue to people in their hometowns. Before (RED), the scale of the pandemic was known mostly in public health circles. (RED) told the story to the broad population and they have responded! (RED) is now a global brand, which is the result of a lot of hard work and tremendous partnerships. That was the critical first step. The next step, particularly in the new political era we are entering, is to make sure that people support this life saving work without any political agenda. We always found that people from all political backgrounds saw this medicine as non-partisan, humanitarian work. As an American, I found it very American to just say, "we're going to do it," and get the medicine to the people who need it to stay alive. And my Irish partner, the great Bono, always said that the idea of America is an international idea. It means the moon shot, trying for the impossible and making it happen. Because hundreds of children are born every day with this terrible virus, we have to keep at that idea. In the ten years since (RED)'s launch, we have earned more than $365 million to support the Global Fund. The money finances HIV/AIDS grants in Ghana, Kenya, Lesotho, Rwanda, South Africa, Swaziland, Tanzania, and Zambia. Millions of people are alive today because they receive medicine from these investments. They are able to take care of their children and contribute to their communities. Yet, in the spread and transmission of HIV, there are still 400 babies born every day with a preventable virus. 2. The spread of HIV/AIDS has slowed but there is still no cure. How do you keep people motivated and engaged in the fight to end AIDS? Unlike some issues, this is a winnable fight. When we started (RED), only 2.1 million people had access to the necessary medicine. But once people understood it took only two pills a day to keep people alive, they supported the fight. And of course, the (RED) products were great and people bought them! Now, 18 million people receive the critical treatment they need and many of them do because people bought a Gap t-shirt, or an Apple iPhone case or another great (RED) product. How great is that? 3. You've spent time in Africa working alongside change-makers and champions. What lessons have they taught you? Listening and listening carefully is the biggest lesson for me. Folks who want and need help know how they would like to be served. Too often care is prescribed by smart people or organizations that are far away from the problem (might have been me!). I am almost never surprised by how little I know. And I know the Global Fund team has this perspective. That's why they have been so effective. 4. Ten years ago, Product (RED) was unique in the way it brought together global brands, celebrities and consumers with health experts, NGOs and governments to address the AIDS emergency. How did you come up with the idea to engage brands in a global health epidemic? The harsh fact is, when we dreamt (RED) up we were desperate. We had promised American government leaders that the private sector would become involved. That was NOT happening. And the government folks called us on it! "You guys promised us..." We needed a complete rethink. But it was hard to get people to see our vision. We had 40 meetings and 36 companies said "no." The four founding brands were very brave. We knew that brands had the marketing expertise and could tell powerful stories, so they would be essential in our effort to raise awareness. 5. Looking back on the last ten years of (RED) what would you have done differently? I would have had more staff at the beginning. We had a huge launch on Oprah Winfrey's shopping spree show in 2006. On the day Oprah and Bono walked Chicago's "Magnificent Mile" visiting stores -- including Gap, Apple, Armani and Motorola -- to feature (RED) products, we had nine staff. The next day, 45 companies called us, including CEOs of major brands. Calls were streaming in. They wanted to join us or wanted a meeting. Of course, we moved fast but couldn't do it all, so we lost some opportunities. 6. You have dedicated your life to activism, philanthropy and public service. What advice do you have for young activists and social entrepreneurs starting their careers today? A lot of people find their work by being angry at injustice. Make your anger work for you! My mother always told me stories about the mistreatment of her "special" sister, Rosemary, who was excluded from places and events. The treatment of her sister really made my mother mad because she knew it was very unfair. I saw that anger motivate her to do many positive things that benefitted others, including starting the Special Olympics for people with intellectual disabilities. I felt a similar anger when I realized that so many people were going to die because they lacked medicine. They did not have a Walgreens or CVS where they could fill a prescription. And because of that, they were going to die. It offended me. I became very, very determined to get that medicine for folks. To learn more about Product (RED) and the fight against AIDS visit red.org.